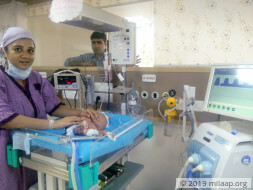 Divya and Mayur gave birth to a baby boy (shaurya) but due to unforseen circumstances the baby was born premature and has been in the NICU for the last 4 months. Shaurya was born prematurely at 23 weeks of pregnancy (5 months+10 days) weighing 740 gms at Surya Hospital on 26 Nov 2017. The baby was in a critical state and required ventilator support but has started to show signs of improvement. 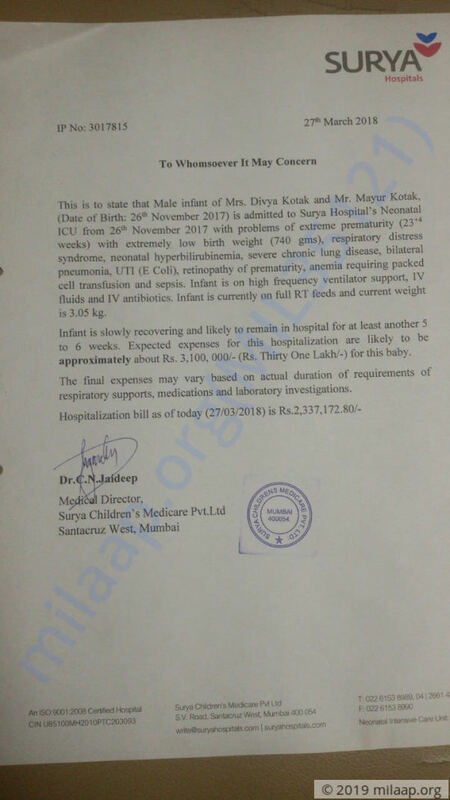 The baby still requires another 4-5 weeks of ICU stay in order to recover completely. Till date the hospital bill is around 23 lakhs and may reach up to 31 lakhs. Your contribution can this baby the chance to live a full life. He needs our help to return home with his parents. The baby was admitted in the ICU and was on oxygen support. He had some lung infection, which further lead to pulmonary issues which deteriorated his health. Doctors tried their best but could not save him. We are grateful for all the support you had shown towards him.We will keep you posted regarding the funds utilization. Baby of Divya faced a few complications and needed tracheostomy in view of respiratory support . Thew baby is now on CPAP support with 40% oxygen through the tracheostomy ant tolerating tube feeds. We will keep you posted on the baby's condition further. Here is an update on the baby's health. Currently, baby is at the hospital and doing fine. The baby has so far responded well to the treatment. However, it will take a few more days before baby is shifted from the NICU and is good to go home. Doctors have advised that the CPAP can be removed once the oxygen support is reduced to 25% or less. There are no complications and the baby has also gained some weight, which is a good sign of improvement.